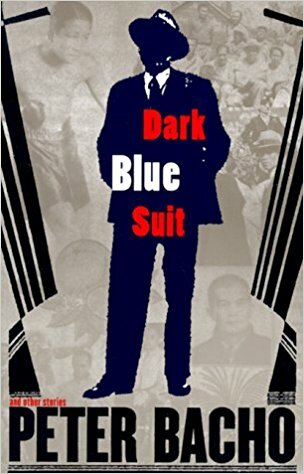 The book cover of “Dark Blue Suit” by Peter Bacho. In “Dark Blue Suit”, I really wanted to talk about the character Charlie and the chapter “A Life Well Lived”. In the book, this character and this chapter stood out to me the most, and out of all the books I glad it brought forward this topic and “the American Dream”. A lot of the variations of what the “American Dream” is revolve around happiness, and that coming from “making it”. But what is “making it”? Does it have to be monetary wealth? Reaching a higher class in society? Leaving your mark on the world? Having and raising a family? That’s why I liked Charlie. As far as how most view the “American Dream”, he didn’t achieve it, but to myself he did, by not giving up on his values even though it would mean a life that much more closely resembled the typical “American Dream”. He chose being able to live comfortably in himself/with himself, than to live comfortably in the physical world around him, which I think is more important. The tangible “American Dream”, can be taken away. It can be squandered away, broken, stolen, burnt, etc. Money and items and the human construct of class, are all subject to change and situations out of your control. To chose that “American Dream” is to chose a life where you would have to alter your views and perceptions to meet societies and everything along in your life with it. No rest or peace, just constant changing and rearranging. Always striving to reach a goal that is more like a mirage, it will forever be on the horizon and never in reach. But how Charlie lived, to be content in himself, with what he believed, which did nothing to harm anyone. That’s something that can’t be taken away. The peace and satisfaction that you stayed true to yourself. In some ways, that is much more difficult to swim against the current than to swim with it. But if you know that the current will only lead you to a waterfall you may not survive or get back up? Wouldn’t it be wiser to keep going against the flow in hopes of finding that spot where it calms down and maybe even fulling your dream? Isn’t it a life well lived is one where you didn’t give up or give in? But kept getting up and moving forward despite everything? Even if your life ended with nothing to show, no physical proof that you lived the “American Dream”, why should that mean that you didn’t live it? Isn’t part of the traditional “American Dream” not giving up? Being your own individual? To pick yourself up by your bootstraps? It’s contradictory, the “American Dream”, the dream of a collective society made up of individuals working together to compete against each other. The expectation that you must rebel to conform. Live unified while in constant competition with everyone else. Have your own choice and voice that both stand out from the crowd and yet harmoniously fit in. Is it really possible to do two things that are in constant conflict with themselves? Maybe. Maybe. Not yes or no, but maybe. That third choice that I think is the first step to depolarizing an extremely polarized society and the choice that requires us to think a little harder. Maybe. Or even, “I don’t know” will do. Cause you have to stop for a moment and think. And I think a third a choice makes everything a little less anxious and maybe more honest about the way things are. 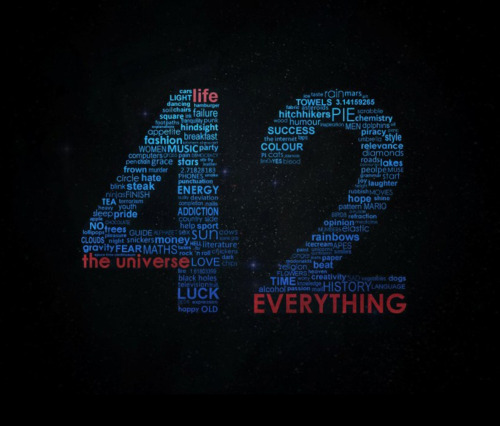 Like the meaning of life in “The Hitchhikers Guide to the Galaxy”, the number 42. The number “42” with the quote from “Hitchhiker’s Guide to the Galaxy” embedded into it. And again it was, “‘a completely ordinary number, a number not just divisible by two but also six and seven. In fact it’s the sort of number that you could without any fear introduce to your parents,” from “The Original Hitchhiker Radio Scripts”. This I can attest to in the creative writing and art I’ve done. Sometimes something just sounds nice, looks nice, feels right and that’s all there is to it. You like it, put it in and move along. And I must admit abstract paintings are the most…fun to watch people “figure out”. Course many believed there had to be a deeper meaning to 42, why Adams chose 42, which inadvertently spurred this list of the various ways and places 42 can be found here on Wikipedia (and many other numbers, just check the sources used). In short, the conclusion was drawn from “42”, the meaning of life was, “whatever you wanted it to be”. And that’s what I think a life well spent is. The American Dream is. And how all these polarized options exist together. The only thing missing is the acceptance that “42” means something different to everyone. End of story.